Could you imagine your college education getting swept from under you with not so much as a word? On Wednesday, November 10th, St. Gregory’s University in Shawnee, Oklahoma announced that at the end of the fall semester they would be closing their doors. 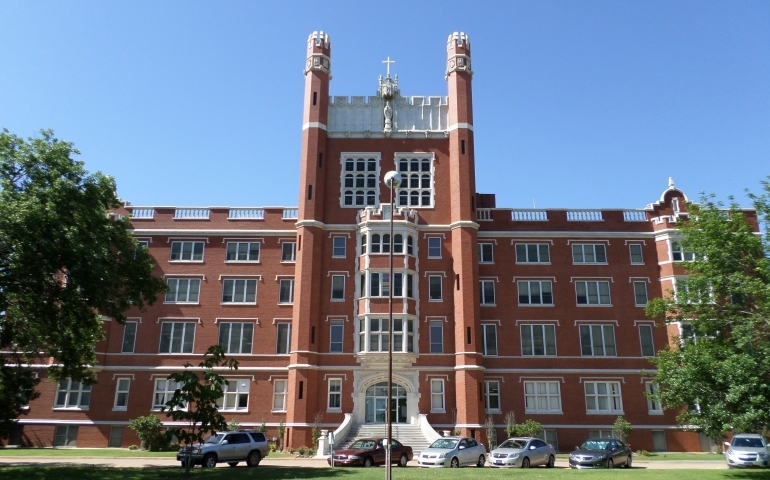 St. Gregory’s was established in 1875, making it one of the oldest establishments in Oklahoma, and it is the only Catholic university in the state. After the news was spilled that the university was unable to receive a much-needed grant, the faculty and staff were still hopeful. However, soon after, things began to crumble. As you can imagine, anxieties and emotions of students, faculty, and staff have flooded the campus. Their once promising future now looks unstable while they have to frantically search for their next steps. In fact, some students were only a few weeks from graduating, now stuck with non-transferable credits and a gigantic question mark. Colleges from across the state came to St. Gregory’s for a college fair held in their gym on Thursday, November 16th, including SNU. Although our admissions staff was on the scene, some of our Residence Life Directors (Bri Morrow and Time Cole) , Director of Resident Life (Katy Bradley) , Housing Coordinator (Emma Riggs) and some Resident Advisors (Brighton Schmitt, Michael Tuttle, Jacob Ponder, Cooper Milford, Benjamin Scott, Wesley Palmer, and Daniel Ramos) made the trip to Shawnee bringing cookies and coffee to serve the students and staff of St. Gregory’s. Bri went on to explain that their Resident Life is structured much differently than SNU’s. There is one female RD, one male RD, a Director of Residence Life, and an intern who is typically a graduating senior. So you can only imagine how heavy a burden they are bearing right now. At one point they gathered around St. Gregory’s Resident Life staff to pray for them. Instead of words of worry or hate, the Residence Life staff from St. Gregory’s proclaimed the Lord’s provision is sovereign in the midst of the eye of the storm. From now until the conclusion of the fall semester, departure dates are separated by department. Students are weighing the options they have, many stressing about the financial aspects since Catholic specific scholarships will be unattainable anywhere else in the state.